SHREVEPORT, LA — The Centenary College Choir will perform one of the great masterworks of the choral/orchestral repertoire, Johann Sebastian Bach’s St. Matthew Passion, with the Shreveport Symphony Orchestra at 3:00 p.m. on Palm Sunday, April 14. This work is a rare undertaking for a community the size of Shreveport-Bossier City and was last staged here nearly 50 years ago. 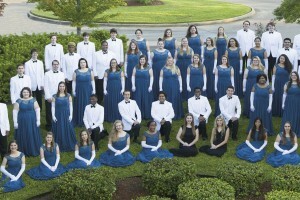 Tickets for performance at Shreveport’s First Baptist Church are available at shreveportsymphony.com. The Prisma Vocal Ensemble, a semi-professional chorus directed by Centenary alumnus Adam Philley, is also participating in the concert that features professional vocal soloists, a large chorus, and a dramatic staging of the Passion story. The piece presents a challenge to the chorus because of the myriad roles it is called to assume, from the crowd shouting “Let him be crucified!,” to the disciples, to the Greek-like chorus giving the audience penetrating reflections on the events unfolding in the drama. Bach uses intentional musical devices and styles to depict these character changes. Michael Butterman, music director of the Shreveport Symphony Orchestra, will conduct the production. Centenary College Choir director Dr. David Hobson has spent the spring preparing the Choir to sing this monumental piece, considered by scholars as one of the two so-called magnum opus works by Bach, the other being his great B Minor Mass. The St. Matthew Passion was famously re-discovered by Felix Mendelssohn in the 19th century, a development that helped to cement Bach’s musical legacy.